THREE BASIC THINGS TO MAKE AN ENGINE RUN are fuel, compression, and a good spark. 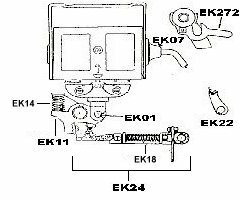 In this section we offer many new parts for high and low tension ignition systems. By "low tension" we are referring to ignitor equipped engines and magnetos that appear so weak that even with bare feet on wet ground a good mag won’t give you much of a shock, if any, let alone jump a spark. To visually check a low tension mag for spark, rub the end of the leadout wire across the ignitor spring while cranking the engine, or to bench test, hold the wire against the gear cogs while spinning the gear. High tension ignition systems use a sparkplug along with a buzz coil (Model “T” style) or a magneto, that if "hot", will definitely get your attention with a spark that will jump 1/4” or more if in good condition. Due to the limited equipment that we have now, we can only work on a few mags. It is best to call first on mag work. We sometimes have misc. mags and ignitors for sale and may take your parts on trade. Parts listed here are for the “old style” Webster (see drawing). Most ngines in the 1-2HP range have a “AMM” or similar type with one magnet, a 2 1/2-3 1/2HP usually was equipped with an “AK” with two magnets, and larger engines up to 12HP may have the “AL” with three magnets. The “AK” and “AL” will interchange and if the mag is in good condition the “AK” will run the larger engines. We sometimes have new and old style rebuilt mags and misc. trip assy. parts available. We’re always interested in buying or trading magnetos that fit the engines we sell parts for. We usually have rebuilt Wico's in stock and we do accept trade-ins. ***For Wico "EK" covers and sideband availability please call for price and current status.